CIMRM 860. Mithras and the egg. See also Mithras and other gods. CIMRM 985. Mithras and the zodiac. These have similarities to a relief in the Galleria Estense in Modena, originally from Mutina or Rome, which shows Phanes rather than Mithras in much the same context.9 This shows Phanes coming from an egg with flames shooting out around him, surrounded by the twelve signs of the zodiac, in an image very similar to that at Newcastle.10. CIMRM 695. Phanes and the egg. 1 Details about this being, with ancient sources, may be found at the Theoi site here. 2 Clauss, M., The Roman cult of Mithras, p. 70. 3 M. Clauss, p.70 n.84. Zenobius Proverbia 5.78 (in Corpus paroemiographorum Graecorum vol. 1, p.151). Theon of Smyrna gives the same list but substitutes Phanes. See Albert de Jong, Traditions of the Magi: Zoroastrianism in Greek and Latin literature, p.309 on this; and more info on the Zenobius passage here and the Theon passage here. 4 Von Gall, p.523, gives this as CIMRM 475. 5 Ulansey, David, The Origins of the Mithraic Mysteries, pp.120-1. Excerpts here. "The identification between Mithras and Phanes indicated by CIMRM 860 is also explicitly attested by an inscription found in Rome dedicated to 'Zeus-Helios-Mithras-Phanes' and another inscription dedicated to 'Helios-Mithras-Phanes'." 6 Clauss, M. The Roman cult of Mithras, p. 70, photo p.71. CIMRM 860 is now at the Museum of Antiquities, University of Newcastle upon Tyne, Newcastle upon Tyne NE1 7RU. 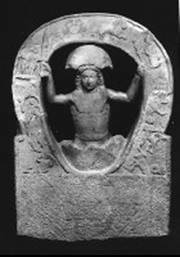 8 Vivienne J. Walters, The cult of Mithras in the Roman provinces of Gaul, p.108-110, item 39 with bibliography, "A stone relief from Trier (Augusta Treverorum), now in the Rheinisches Landesmuseum, Trier, Inventory no. S.T.9981. See plate XVIII. Google books preview here. "At Housesteads, which has produced perhaps the closest parallel for the Trier relief, there was a cult relief behind the egg birth and flanking altars." On p.25 the author suggests that the same may have been true here at Trier. 9 Hubertus von Gall, The Lion-Headed and the Human-Headed God in the Mithraic Mysteries in: Jacques Duchesne-Guillemin(ed. ), Études Mithriaques, p.511-526, p.522. Google Books preview here. CIMRM 695-6, fig. 197. Von Gall states that some scholars believe that the Housesteads relief is in fact a Phanes sculpture which has been reused by the Mithras cult. 10 Vermaseren, M., The miraculous birth of Mithras, p.287 n.10. 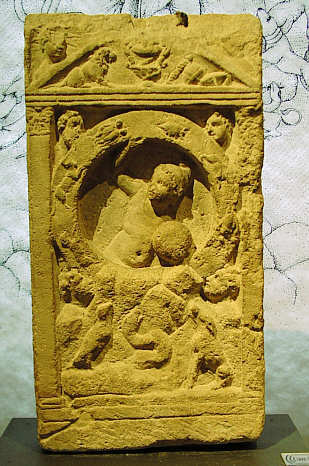 The relief is in the Estense Museum in Modena, Italy. 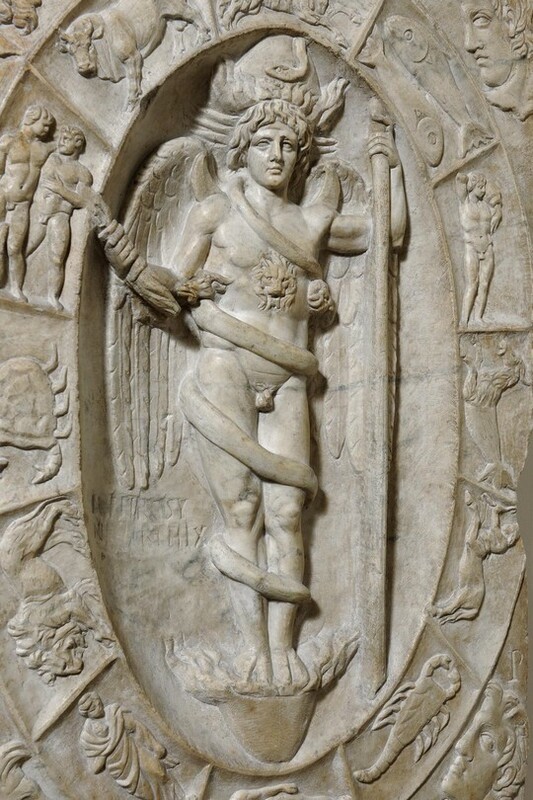 See also F. Cumont, Mithra et l'Orphisme, RHR CIX, 1934, 63 ff; M. P. Nilsson, "The Syncretistic Relief at Modena", Symb. Osi. XXIV, 1945, 1 ff. 11 Ulansey, David, The Origins of the Mithraic Mysteries, p.120.